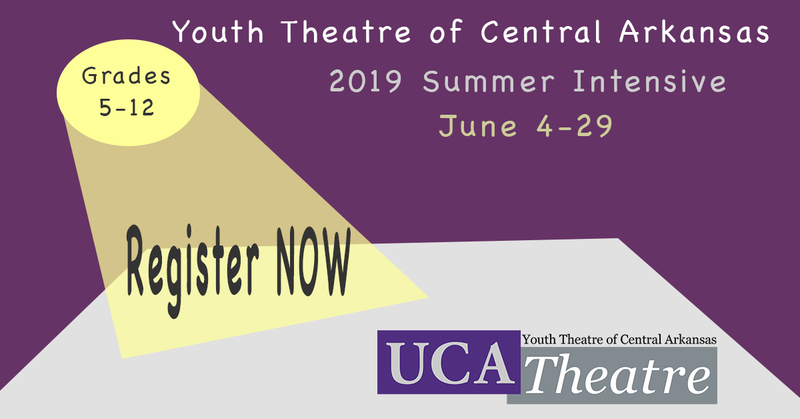 Founded in 1989, UCA Theatre hosts the annual Youth Theatre of Central Arkansas Summer Intensive Program. We are dedicated to providing quality, intense training to young people in order to introduce and encourage them to experience the creative, imaginative world around them. As the only university-supported theatre training program in the state for young people, YTCA offers training and working in a professional environment, on stage and behind the scenes. There are many skills students will learn through theatrical arts including, but not limited to creativity, innovative problem solving, the strengths of non-verbal communication, collaboration and team work, listening skills, receiving constructive feedback, accountability, perseverance, and confidence. This training culminates in a performance open to the public. *These are the grades they will be entering into next academic year. Student call is at 6:00 PM. *There will be a pizza party for the students at noon on Saturday, June 29. Student call is at 1:00 PM. Registration and fees are due by Wednesday, May 29; registration and fess for the early-bird specials are due by Friday, May 3. Registration closes on May 29. Fees should accompany registration form. There will be a $35 processing fee for any returned checks. If you are paying for registration for more than one child, ask about our multi-child discount. Students who withdraw from the program before June 3, will receive a 90% refund. Students that withdraw between June 3, and June 7, will receive a 60% refund. No refunds are issued after June 7. Students may apply for financial assistance through our scholarship application. These are approved based on financial need only. Requests must be submitted by May 3, along with the registration form. A non-refundable $35 security deposit must accompany each application. You will be notified by May 10, if the funds been awarded and the amount awarded. Any remaining balance must be paid by June 3. Click here if you’d like to receive information about upcoming classes YTCA events. Please contact Melissa Pearson, Theatre Business Manager, at melissap@uca.edu.